1981 Datsun ZX - This car has 27,000 original miles on it. If you do the math, that comes out to less than 950 miles per year, or less than three miles per day, per year. This is not a turbo like the one owned by JaCG reader Richard, which I featured back in April, but still, it's a nice car. I don't understand how you can have a car like this and drive it less than 1000 miles per year. The seller gives little info about the car and no explanation for the low mileage. However, judging by the pictures, this has to be one of the nicest 280 ZXs on the market. 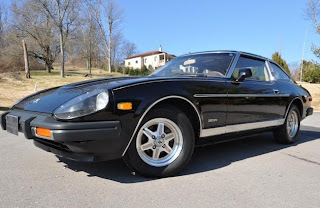 If you're in the market for a Datsun 280 ZX, it would be worthwhile checking this one out. If you buy it, drive the hell out of it. Located in Nashville, TN, click here to see the eBay listing. Hey Dave - Here is a game that roughly translated is called "Roll Dominos." If the current post is a red Alfa, then the next guy that posts a photo has to be either a red car, or an Alfa. At over 8000 pages long, many in France appear to be serving life terms in prisons with great cable internet connections. The site can be found here. There are some great pictures of European cars. Just don't start looking at it late at night. The vehicle shown above is a Katar. It's apparently based on a Citroen 2CV. You can find it on page 8566. 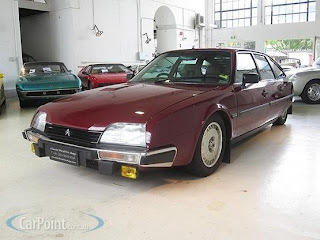 "This car was among the very last of the CX series ever imported into Australia. They were intended as "guinea pigs" to test the resilience of the engines for unleaded petrol, which Australia mandated the following year. After this model, an update version with awful plastic bumpers and redesigned interior was introduced in Europe, but these never found their way to Oz. In any event, this car is something of a time-warp machine in that it's virtually as-new - and with a very low mileage to boot. Dave, I need more MONEY!!" Located in New South Wales, Australia, click here to see the CarPoint.com.au lsiting for this car. 1973 Triumph Stag - Someone needs to finish the job this guy started. The seller writes, "This car does not have an engine or transmission, it came to me with an American engine and auto trans that I removed and disposed of." Too many people have taken the Triumph V8s out of these cars and replaced them with something else. It's great to see someone doing the opposite. Yes, when new, the Triumph V8 was not the most reliable engine around - Timing chains broke, heads warped and water pumps failed - but all of those problems have since been cured by owners and/or the aftermarket. The Stag was meant to have a Triumph V8 in it. It would be great to see someone put one in back into this one. Located in Medford, OR, click here to see the eBay listing. I thought that the Stag had the Buick aluminum block V-8 in it. Buick used the engine for a short time and then sold the design to British Leland where they installed it in various cars. The only thing I ever knew of that the engine was good for was boats, where it could get all the cooling it needed. No, the Stag had a unique Triumph V8. It was essentially 2 TR7 4 cylinder engines attached together. There's a pretty good Wiki article about the engine here.